When the Intergovernmental Panel on Climate Change released its latest report in October 2018, I couldn’t tell whether I felt a sense of impending doom because of the climate crisis, or just general anxiety. I experience a constant struggle to balance pessimism with optimism, and the hardest of all to balance is my anxiety about what we’re doing to our planet. I’m aware I’m not alone in this struggle. Anyone who cares about the world we live in — the plastic in our oceans, lakes, and rivers, rising CO₂ levels in the atmosphere, and rising sea levels down here — has had moments of fear for the future. My reading took me to a dark, dark place; I felt utterly paralyzed by the inevitability of it all. I tried to read everything I could about scenarios if the planet warms by only 1.5℃, or as high as 4℃. My reading took me to a dark, dark place; I felt utterly paralyzed by the inevitability of it all. I found myself thinking about emergency preparedness, all the friends who might be displaced, and eventually of a dystopian future in which society had broken down and we were left to fend for ourselves. As my obsession with reading dire environmental forecasts grew, I started to wonder about anxiety linked specifically to climate change. Turns out it’s a thing, and it can have serious impact on people’s lives. I’m pretty sure those people include me. Eco-anxiety hasn’t yet been listed in the American Psychiatric Association’s Diagnostic and Statistical Manual of Mental Disorders (a.k.a. the DSM-5), which is considered the gold standard for mental health assessment. But the American Psychological Association — in collaboration with environmental charity ecoAmerica — produced a 69-page report in 2017 pointing to the impact climate change, in all its manifestations, can have on the human psyche. Eco-anxiety first gained attention a little over a decade ago, with coverage in the Philadelphia Inquirer and San Francisco Magazine, among others. According to some articles from the time, the source of many people’s eco-anxiety was attempting to make the most eco-friendly consumer choices based on conflicting information. We have a whole new reason to suffer from eco-anxiety: we are witnessing the devastating effects of climate change in our lifetime. With evidence of our rising mean global temperature as plain as day, I feel almost nostalgic for a time when decisions about the “greenest” light bulb were considered a source of stress. We have a whole new reason to suffer from eco-anxiety: we are witnessing the devastating effects of climate change in our lifetime. Scientists aren’t sugar-coating their findings, and even the most conservative climate predictions show catastrophic changes for many parts of the world. Great thinkers have written about it, and if you’re a Millennial, you’re probably suffering from it. It’s important to be clear that plenty of people may occasionally feel anxious about how climate change might affect their family and community. What separates these folks from those who might need treatment is the degree to which their daily lives are negatively impacted. If your day-to-day life — relationships, your ability to do your job — is affected by your fears of climate change, it’s time to take those fears seriously. According to Dr. DePompo, many of those suffering had some form of manageable mood disorder — like mild anxiety — until climate-related fears pushed them over the edge into pathology and the need for treatment. For example, he described one patient actively planning for their child’s eventual escape to Canada, because they believed it would be one of the last habitable places to live. This planning was having an impact on their marriage and family life. If you live somewhere at high risk of a hurricane or wildfires, it’s easy to see how eco-anxiety might be on the horizon. There’s no way to extrapolate trends from one practice, but many of DePompo’s eco-anxiety patients are parents of young children. This shouldn’t surprise anyone, given how anxious most parents are when their kids walk to school alone for the first time. If that’s worrying, and you live somewhere at high risk of a hurricane or wildfires — both of which are increasing in intensity each year — it’s easy to see how eco-anxiety might be on the horizon. As someone who regularly shuts down when considering how I can actually help save the planet, this strikes me as a really beneficial shift in perspective. DePompo explained that there are different approaches to treatment depending on how the anxiety presents, but the goal is ultimately to get patients back to a state of mind where they can use coping skills to manage it. The more a patient sees something as dangerous, and the less they believe they can cope with it, the more anxious they’ll become. 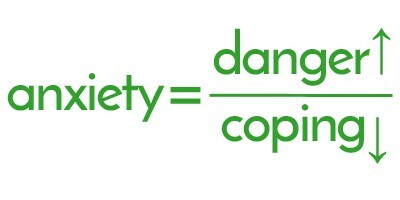 DePompo used the above equation, which is taught by CBT therapists, to explain why eco-anxiety is the perfect storm for our mental health these days. Our perceived threat level from the environment is only increasing, while very little mitigation has been undertaken by our governments. It can leave individuals feeling helpless. It can feel like my individual choices are a drop in an ocean filled with plastic. This sounds easier than it looks, at least for me. It’s impossible to avoid news of the latest dire consequences our planet is facing as a result of climate change, and I didn’t expect to experience them in my lifetime. It can feel like my individual choices are a drop in an ocean filled with plastic. Then, I see Sweden’s 16-year-old climate activist Greta Thunberg in action and I’m reminded there’s reason to hope, after all. If she can cope with the future of this planet, so can I.